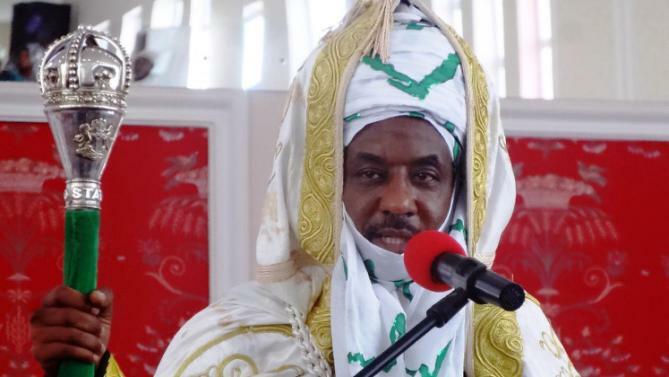 The Emir of Kano and also the Former Central Bank of Nigeria governor, spoke extensively on the nation’s economic recession while delivering a paper titled, “Nigeria In Search Of New Growth model” at the 15th meeting of the Joint Planning Board and National Council on Development Planning. We knew that this was going to happen. You can’t just keep borrowing money and paying salaries, not building roads, not improving power and think this will not happen. First of all, I want to break from tradition. Usually I speak in Hausa in Kano. But, I don’t know how I am going to make an economic presentation in Hausa to 36 states’ commissioners and have someone translate it into English. To avoid things being lost in translation, I will speak in the language of economics. Let me start by saying congratulations to you Minister of Finance, Kemi Adeosun. This is the first time I am meeting you in an official function since your appointment, and to tell you in public what I have always said in private; that you are one of the sisters I remain extremely proud of your work. I wish you all the best in these challenging times. I have always told people that Dr. Shamsuddeen Usman, my teacher, (I don’t know if he is an ex or former minister, multiple times) taught me microeconomics. So, he takes a lot of the credits, and none of the blames, for what I have become. Look at the road ahead. You know this is all a combination of old sets of policies. There are times in the history of this country when we had it right. But, we didn’t continue. A lot of the reforms done in the second term of Obasanjo laid the foundation for sustainable growth. But, then we kept going back and forth. Because the concern today is the concern about the recession Nigeria is in technically, and also because it is a meeting of Planning and Budget Ministers, I thought I will do a proper economic presentation and put down my thoughts on where I think we are; why I think we are where we are, and what I think we need to do to get out of this. I am sure there will be many other presentations specifically on what a state can do to raise revenues and so on. But, having an overarching view of economic policy, and where we may or may not have done wrong, or what the key drivers of growth should be for the Nigerian economy are things I thought we should talk about at this session. So, I call this presentation, Nigeria: The Search For A New Growth Model. I will start by going back to the past, not just Nigeria, but Africa. Let’s ask ourselves what were the key drivers of growth in Africa, and what has changed since this golden decade Africa had. Africa Golden Decade was basically the decade of the 2000s. Africa moved from the previous decade, where it was a hopeless continent, to a new decade that we have one type lifting all story of Africa rising. This rise in Africa across the world was one of stories of sadness, poverty, famine and hunger to a continent that was full of potentials; where there were opportunities for investments; where capital markets were booming. All of a sudden people heard countries like Nigeria, Kenya, Ethiopia, Ghana, etc. when previously these were supposed to be a basket case in the world. The first pillar of this growth was clearly shifting terms of trade, which as we all know in developing economics, can be a mirage. You can’t have improving terms of trade when you are exporting commodities over short periods of a cycle. But, we know as far back as the 1950s, from the Latin American structure economics, that over the long term, any economy that specialises in exporting primary products and importing manufactures would end up having terms of trade shifting against it. You can have a temporary boost, but If you don’t use that boost to have a structural adjustment that would make for prudent management of the economy, you would be courting trouble. By 2008, one barrel of oil would buy you one Sanyo flip telephone as against 19 barrels of oil to buy the same phone earlier. That gives an idea how well the terms of trade have shifted. We had an oil price of $10 a barrel in the time of Babangida. At one point under Obasanjo, it rose to $140 a barrel. This was a time of rapidly improving technology, cheaper manufactured products and therefore our oil could technically import us much more. Where did all these debts go? Did it go to roads, power, refineries, or infrastructure? No. The new borrowings were simply recycled into much higher recurrent expenditures. What that did was that it helped sustain a consumption boom. And GDP was growing, largely driven by consumption spending. This process was not common across all of Africa, because we are aware of other African economies that grew, and certainly it was not just one pillar. Let’s go to the second pillar of growth in Africa in that decade, which was debt. Between 2002 and 2008, the levels of debt to GDP (gross domestic product) in African countries and what they became after the Paris Club, HIPC debt reliefs and so on. Nigeria was at 50 per cent debt to GDP and came down to literally 5 per cent or so. This happened across all Africa in the form of debt forgiveness, debt relief, debt restructuring and so on. What this did was that it freed up government balance sheets and in that decade of Africa rising, the countries went back on a borrowing binge. Nigeria kept borrowing, not externally, but internally. I think our external debt was just about $8 billion on the balance sheet. But, the Naira indebtedness of the Nigerian government, we were spending over 30 per cent (maybe 40 per cent now) of every Naira earned just servicing debts. That’s what you have. Nobody was noticing it. We have written off the debts, and then we kept building it up bit by bit. And when you look at where that debt was going into, you will see why, or part of the answer to the problem we are having. So, we have these two pillars – rising commodities prices, and we monetise oil revenue, we will be able spend money. We were able to borrow because the balance sheets could accommodate more debts. If you look at public sector wage bills in real terms, Nigeria, Ghana, Ethiopia and Kenya, you will see it was rising significantly from 2005 to 2014. In Nigeria, for example, our public sector wage bill went up from N443 billion in 2005 to N1.7 trillion in 2012. In 2010, the government increased minimum wage to N18,000. I was at the Central Bank, I protested and protested. They had an election coming, they increased the minimum wage N18,000 and basically borrowed money to pay. In 2012, as governor of Central Bank, I said this was an unsustainable wage bill. We needed to reduce the size of the public service. My own government minister came out to say that was the (CBN) governor’s personal opinion. In fact, she said the government wanted to employ more people. And this is the result. I am serious. Sometimes I don’t bother. I’m never going to change. I’m never going to be political. I’m never going to stand here and tell people what they want to hear. The problem is that there is nothing that we are facing today that we did not know would happen. That is the truth. We made mistakes. Many of them deliberate. We ignored every single word that pointed otherwise. Economics is a science. It is not a perfect science. But, over decades and decades and centuries, people have seen that there are certain things that, when you do, will lead to certain consequences. If you take a brand new car and give a driver who doesn’t have a license to drive it and you have an accident, you really can’t say you were surprised, unless you are some kind of idiot. We will see the per capita investment development in Nigeria and per capita results we are getting. These were all from a resource in an enclave economy. And not so that we are not always blaming the previous administration, we have also made mistakes in this administration. We have started retracing our steps. But, we have to retrace those steps. And if we fall into the same hole that we fell into the last time, where the government is always right. When the minister is there, you tell them, “You know, Hon. Minister, Nigeria is very lucky to have you in office.” No! You tell the minister that you are doing well, but, you know there are these areas that you must change. If a policy is wrong, it is wrong. Nothing will make it right. And it has to be changed. So, this is what we did. Look at real sector wages. It was not just Nigeria, it was all over Africa. Look at sovereign debt fuelling growth. If you take the example of an individual. You happen to know bank MDs and you can make a few phone calls and get loans. You borrow N1 billion here today and build a very nice mansion in Abuja. You borrow another N1 billion and let your family go out on first class ticket as you are travelling all over the world. You borrow another N5 to N6 billion and buy a private jet. We have very many people in Nigeria who you think are very rich. But, who are really bankrupt, because everything about them are being financed by bank debts. When one debt matures, they have enough connections to call another bank, borrow and refinance that debt. They are not earning anything. They have private jets. They have yachts. Their families travel first class. They go abroad and stay in the most expensive hotels. It happens. And it is happening today. What do you think of those people? When you think about such people, do you think they are foolish people? Or do you think they are wise people? So, what would you say of a country that does this? So, you feel growth by borrowing money, pay salaries, people spend money on pure consumption spending, nothing is produced. It’s fine. It’s short term. But, it is not sustainable. How much can you continue to borrow and consume without producing? And the funny thing is, you did not have to stop borrowing. All you had to do was borrow the right amount and apply them to the right purposes. It doesn’t matter whether they were consumption spending or investment demand, GDP will grow. So, make a choice. As a country, we made a choice. We wanted votes, popularity or palliatives, so long as people are getting high minimum wage, we keep quiet about all other things that were happening in the economy that we should be talking about. That was the relationship between public debts and GDP growth. Today, we are in a new reality. This is what they call the new normal in Africa. And we have a two speed Africa. If we look at the new IMF World outlook, you will see something interesting. Non-commodity Africa will be the fastest growing part of the world, even higher than emerging Asia, whereas commodities Africa (countries like Nigeria and Angola) are among the lowest growing parts of the world, at the rate of Europe and Latin America. And we can’t explain why. But, think of a country like Ethiopia and then Meles Zenawi, the late Prime Minister. Ethiopia keeps growing year after year at 11-12 per cent. And what did Meles do? The simple things we have been saying for decades and decades and decades. This is a country that came out of a war, remember? So he said: “Why don’t you teach them?” So, he got in touch with the IFC (International Finance Corporation), got a loan, organised Ethiopian coffee farmers into cooperatives, taught them how to grow the coffee, how to dry, prepare and package it. Today, if you go to coffee shops in Europe and take a cup of coffee that came straight from Ethiopian farm. And Ethiopian farmers are now getting 70 per cent of the value of the coffee, from the former 10 per cent. So, he tells Aliko Dangote, come and build a cement manufacturing plant here. I am going to give you electricity at three cent per kilowatt hour. For a cement manufacturer, that is all the incentive that you need. So, Dangote goes, builds the most sophisticated cement plant in Ethiopia, gets electricity almost for nothing and cost of cement drops by 60 per cent. The construction industries gets boosted. Roads are being built with cement. Jobs are created. And new industry has taken off. Nigeria imports 3 million pairs of shoes per annum from China. Nobody knows how much duty they pay. I am not talking about expensive shoes. I am not talking about what you buy from Pierre Cardin, or Gucci. I am talking about shoes people wear on the streets. Shoes that can be bought here in Kano. We can produce all the shoes, and school bags we want for primary and secondary schools children, millions and millions of pairs. No, we don’t. You know what we do, we export the wet blue and we import from shoes from China, and we have Chinese people coming here to take wet blue to China and bring back shoes. We are just a very interesting country. Every single thing we are talking about today about what we need to do have been said before. I have a document “Industrialization Potentials of Northern Nigeria under Ahmadu Bello, 1962.” There is nothing we are saying today that was not part of the industrial plan of Northern Nigeria in 1962. We are clapping ourselves that after 50 years, we have learnt nothing. The whole industrialisation of Kano, starting from Bombay to Sharada to Challawa had space on that plan. These are very simple economic logic. You cannot continue doing the wrong things and expect to have the right result. Since 1950s and 1960s, they understood what was the essence of colonialism. It was to come to these countries, take our raw materials, process them and sell us manufactured goods, and keep shifting the terms of trade against them, so you get richer at their expense. They understood that independence was not about the flag, but about reversing that process. They understood it. We did not. And therefore they said we needed to stop exporting our cotton. We need to build textile industries. We need to stop exporting groundnuts. Kano used to take pride in groundnut pyramids. I still have people who come to me and say: “You know, Emir, you must bring back those groundnut pyramids.” But, I don’t build groundnut pyramids. I want oil mills. What am I doing with groundnut pyramids? They stopped exporting groundnut pyramids and build all these oil mills. We should stop exporting hides and skin. Huge multinational corporations that came to Nigeria, whose business was to buy hides and skin. A company like John Holt. In Hausa anyone who trades in skins is called ‘Dan Janho’. It became a Hausa word, because this was a multinational whose duty was to just buy hides and skins and take to Europe to produce shoes for us to buy. So, they said let us build our own factories and produce our own shoes and bags. It’s so bad in this country. Tomato paste that our wives use in kitchens is imported from China. At best, it is packaged in Nigeria. Now, we have a paste factory 40 kilometres from Kano. That’s about the first. We cannot process tomato. We have to import tomato from China. It’s a very sad case. A country of 170 million people last week Nigerians were celebrating, because we went to Rio and came back with one bronze medal. I saw Nigerians jumping. Somebody said at least we were on the medals table. We don’t have ambitions as a nation. Some of these things are not just about numbers. It is about a mindset and a people and attitude. Do we really love our country? Do we feel any shame when we say that Malaysia that came and took palm seeds from us is now exporting palm oil? Palm oil is what Eastern Nigeria people eat. Now, we can’t produce it. Vegetable oil, groundnut oil. I went to my friend’s house the other day in Lagos and they gave me Moringa tea in a nicely packaged tin. That is the thing that grows wildly here in the Northern part of the country. Somebody takes Moringa, puts it in a tin, packages it. I did not even know it was called Moringa until I took the tea. They packaged it and gave it an English name. I did not even know it again. It was after I drank it that I knew it was Zogale, as it is called in the local language. If they had packaged it and called it Zogale, it would have been known as Zogale tea all over the world. Just like people know coffee from Ethiopia. But, now that it is called Moringa, a Hausa man does not know what Moringa is, and it is growing in his backyard. Then, he takes pound sterling to import Moringa tea. So, this is what Ethiopia did. I will show you what countries like Kenya did, which we didn’t do, and therefore Nigeria is right there in the low band and non-commodities Africa is in the upper band. What is it that works? What is it that these non-commodities African countries have done that we have not done? First, take a model that is investment-driven, rather than consumer or consumption-driven. At the very top, you have Ethiopia, Uganda, Rwanda, Ghana, Kenya and Egypt. Those at the bottom are Angola and Nigeria. And if you talk today in Africa, they will think Nigeria and Angola are the richest countries, because they are oil producing. But, the truth is that we are the worst performers, in terms of investments to GDP. If you look at the other countries that do not have oil, look at what they have done. If you have a high investment to GDP, you will deliver high growth that is also inclusive. If you continue working on consumption and rent-seeking model, your growth is not inclusive, which is why in Nigeria, you have, over the past two decades, increasing income distribution inequalities. It is very easy to be very rich based on rent. Again, we can always talk about the policies of previous administrations. We talk about oil subsidies that brought oil billionaires. But, we have also created our own billionaires since 2015 from foreign exchange subsidies. People are shaking their heads. They don’t seem to understand what I mean. Let me give an example. I did not just become an Emir. Before then I was Governor of Central Bank. Before then, I was a bank MD. So, I have friends in the banking industry. When the CBN was selling dollars at N197 and people were buying at N300, if I sit in my garden and make calls on the phone, I will have enough people to call in the industry to get me $10 million at official rate. Do you doubt it? As a former MD, former governor of the CBN and what they now call a royal father? Think about. I sit in my garden and make a few phone calls, and get $10 million at N197 per dollar and sell at N300 to the dollar, I will make a profit of N1.03 billion. If I do that four times in a year, for doing nothing, I would have had N4 billion. And people were telling us that this policy was to help the poor. We are not devaluing the Naira, because if we do the poor people would suffer. The people that were profiting from this were people that were telling the government that if it devalued the Naira people would suffer. Meanwhile, they all got the dollars at N197 and priced their goods at N300 to the dollar. The poor paid the price of a devalued currency and the rich schemed off the profits. It went on for one year. We talked and talked and talked. If this government continues to behave the way the last government behaved, we will end up where Jonathan ended. We may not like it. But, that is the truth. You have to listen. You don’t need to be an economist to know that any system that allows you to sit in your garden and with a telephone call make N1 billion without investing a kobo, that system is wrong. It is unsustainable, no matter how positive you think about it. So, the first thing I will like to say is that there are many voodoo economists parading around. And many of them are not economists. They are demagogues. They tell poor people, anyone that says devalue the Naira wants you to pay a high price. It is arithmetics. It is not economics. Many of the arguments I see in newspapers, sometimes I feel like writing back, and I will remember I am an Emir and I am not supposed to. That you have someone who writes what you call a brilliant economic paper, and he is telling you that if you devalue the currency prices would go up. Is that economics or arithmetics? It is arithmetics! If you ask your boy in Primary 3, if the dollar costs N150 today, and tomorrow it costs N300, what would happen to prices? He will tell you prices will double. He can calculate. One times 300 is two times one times 150. That is not economics. That is arithmetics. The economics of it is, these billions that are being schemed off by people who get official exchange rate, should you give the states their revenue. For example, should you take dollars, for every $1 billion taken from the Federation Account and sold by the CBN at N200 to the dollar, the states were losing N100 billion that could have gone into salaries, agriculture, healthcare. Yet, the states were going to borrow from the same government on a bailout when the government was selling dollars cheaply to a small group of people. What kind of economy are we running? Who is advising the government? I have asked that question before. I want to know so I can talk to the adviser. We did not have money. Oil prices had collapsed. Niger Delta Avengers were blowing up oil wells. The scarce dollars we had, we were selling cheaply, subsidizing people. What was the argument? We need to promote manufacturing. Right? Thank you. But, what percentage of your GDP is manufacturing? Eight percent. Your option is to buy raw materials, establish a letter of credit, import raw materials, maintain generators, buy diesel, pay labour, produce your goods, take the risk you may not sell at a profit, transport it, or to make a profit margin of 10 per cent over a 120 term period, what would be your choice? Would you import and manufacture? You have an automatic guaranteed 50 per cent return immediately for no labour. With this every manufacturer abandoned production and started looking for FOREX. I had people who would come to me or telephone me and book an appointment only to ask me: “Your Highness, I want you to help me get dollars.” They wanted to turn me into a dollar middleman. So, every manufacturer decided that he would get the dollar and sell, instead of buying raw materials and producing. So, what happens to production and employment? What do you end up with? A recession. And why are we surprised we are having a recession? We created it. But, we did not call it recession. We called it demand management. People were using words they did not understand. You want to manage demand? Fine. You will manage demand for industrial raw materials, you are also managing industrial output. You manage demand into inputs to services and manage down service outputs. The result we have was the result that we were always going to get with sets of policies we put in place. And we don’t realise that we made those mistakes. I am glad it seems we have. But, we need to just come out and come clean. That is the best way. We have taken a few wrong steps. It was all done in good faith. We genuinely wanted help the poor people, that’s why we made those mistakes. Now, we are retracing our steps. Now we begin to talk. Let’s look at the GDP against government spending. For Nigeria, from a base in 2005 to 2015, GDP has been rising nominally, driven largely by recurrent expenditure. If you looks closely, recurrent expenditure seems to spike on the eve of elections. The economy has quadrupled in nominal terms since 2005. Our population has grown by 40 million since 2005, but capital expenditure has not changed. 40 million more people, but we don’t have more power, roads, schools, hospitals houses, etc. Where are these 40 million people going to be? The Niger Delta creeks and Sambisa Forests? Our economy, at least in part, created terrorism by simply not creating the opportunities for these young people. If you think the Niger Delta or Boko Haram or other insurgents or something are the issue, let me give you another number. We have over 160 million Nigerians today. The median age is 19. In the next 20 years, we are going to have at least 80 million Nigerian men and women between the ages of 20 and 40. Maybe in the next generation you can start doing something about it. You can start family planning or something. But, these ones have been born, and we have to prepare for them. Those of us who are alive now, we have to prepare for what we are going to do with these 80 million young people. We can’t kill them. And if we do not expand the earnings and production base of the economy through wise investment and very difficult, but appropriate decisions, we will end up in a classical Malthusian situation, where the resources cannot support the population and we start having wars and pestilence. This is Rev. Thomas Max, one of the very first lessons you learn in EC101. Look at the road ahead. You know this is all a combination of old sets of policies. There are times in the history of this country when we had it right. But, we didn’t continue. A lot of the reforms done in the second term of Obasanjo laid the foundation for sustainable growth. But, then we kept going back and forth. And I am hoping that in here we are not like the ordinary innate Nigerian. We do feel a level of shame at what we see. You have got your per capita nominal income – Angola, Botswana, Cote d’Ivoire, Egypt, Ethiopia, Ghana and Zambia. Per capita income in Kenya is $1,388. In Nigeria, it is $2,943. So, on paper, Kenya is half as rich as Nigeria. So, how much is Kenya able to raise as tax revenue per capita? $232. How much was Nigeria raising in 2014-2015? $117. Now, how much was Kenya spending as development spend per citizen? $129. How much was Nigeria spending? $17. The research you see don’t just come out of nowhere. They are the direct consequence of deliberate policy decisions. If you choose to make it very profitable for people to produce fake bills of lading and claim fuel subsidy and build estates and private jets, we are never going to have refineries. If you make it profitable for a Chinese man to come to Kano…. Now in Kano, the Chinese are doing tie and dye. Even the tie and dye pit that has been in Kano for about 600 years are at risk. We have been talking about the protection of this industries. Minister of Planning, nobody has done anything you know. In the next 10 or 20 years, if people of Kano starts picking Chinese and throwing them into the dye pits, because they are importing simple dye, they took the technology from Kano, went to China and they will now be coming to ask the people the pattern that they want. They come in, they bribe Customs, and because there is no way you can produce that thing in China and bring it and they sell and our industries are destroyed. The textile Industries in Kano are gone. The tanneries and leather industries are gone. A combination of a lack of electricity and infrastructure, lack of investments and very bad trade policies. We have to go back to the drawing board. This is why this conference and the Ministry of Planning are the most important economic Ministry. I have always said that the Planning Minister is the most important Economic Minister. Assuming that, one, he is able to produce a very good plan, and two, that the government listens to him. And this is why I thought instead of coming here to talk about just monetary and fiscal policy, I will talk about them. But, let’s try to get into a mindset, where at the federal, states and local levels, we can actually look and see what we can do to change this things. So, are we going to adopt an investment driven model? Now, we talked about the public sector, and public sector fundings, and when I come forward I will show you that for Planning Ministers, you need to think beyond what the government budget is. If you need to build a road, your job is not about whether you can raise enough taxes to build the road, it is whether you can fund that road. With the combination of taxes, and debts and investment and whatever, that road needs to be built. It doesn’t have to come from the government’s balance sheet. Nobody says the government must fund every single thing that is development. This is where investment becomes important. We are not getting money from oil. Our non-oil revenue is not rising fast enough. We talk about taxation, but there is a limit to how much you can tax a man who is not able to eat. And also, there is a limit to how much you can continue borrowing in Naira. You know, we play with these numbers. When I was in the Central Bank, we say: “Oh! You know, our debt to GDP ratio was 25%, therefore it is nothing to worry about. It is not up to 70%. Your debt to GDP ratio is 20%, and you spend 30% of your revenue servicing debt. What does that tell you? 70% of your GDP does not generate government revenue. Agriculture is about 35%. How much tax does it pay? Wholesale and retail trade, how much tax does it pay? You have a GDP where the tax is coming from the oil sector and telecom’s. That’s your government revenue base. And those sectors constitute maybe 30% of GDP. So, for all intents and purposes, gentlemen, if your debt to GDP ratio is 30%, and only 30% of your GDP is generating revenue, you are at 100%, until you broaden your tax base. If you just look at debt to GDP ratio, there is no reason why the Nigerian government cannot borrow more than N2-3 trillion. But, let them borrow now. When are they going to pay? You don’t pay debt from GDP. You service debt from revenue. Nobody talks about debt to revenue. What’s the good news? It’s that Nigeria is not all about oil. I know we all think it is oil. But it is not! Oil does not form even a critical part of our GDP, or our growth. Look at these numbers. That’s your GDP per capita. The present value of your oil reserve in 2016, which was calculated based on 37.2 million barrels, $60 a barrel, production horizon of 40 years and discount rate of 12 per cent. If you sold the entire oil reserves of Nigeria today, the proceeds will add only $1164 per head, compared to GDP per capita of $3000 in 2016. So, those making noise about oil should stop making noise about it. People should stop being afraid, because oil is not critical. It is just a working capital. We sell it. We get the dollars that we use to import. If you can find another source of working capital, we can do without it. It is 15% of GDP. When I was governor of Central Bank, the economy was growing at 37%. The oil sector was not adding anything to GDP growth. The growth was coming from agriculture, services and trade, which is also very revealing. If we are now saying we are in a recession, because of the collapse in oil price, we are not being sincere. You can’t be in recession, because a sector that is 15% of your GDP has declined. What happened to agriculture, trade, services and health? Something else to look at. This is the slide that got me sacked from my job. You know the truth will always be there and I like this power point presentations because the figures tell you more than a thousand words. These are our external accounts, now look at Nigeria and look at Kenya up there in the blue line. These are current accounts surpluses we have had from 2005 to 2014. Not even one oil price rise in 2014 did we have in our current account deposit. I think today, up to 2014 we have current accounts surpluses. Now, below there you have other investment assets, which will be your capital inflows. I mean your reserve, and you have something called net errors and omissions. Look at 2014, the errors and omissions were about $20 billion, from about minus 5 to minus 35, about $30 billion actually. So, when you are an accountant and you produce accounts and errors and omissions that are 70% of the numbers, or 60%, what does that tell you? Look at that, so where do we have a problem? First of all, as you can see we have not been able to attract investments. All the other investment assets headed as errors and omissions had been headed out. Which means, the money went out and did not come back. Anything below the zero line represents money that went out of Nigeria and did not come back. Anything above represents what came in on the net basis. Now, a country like Kenya was having huge trade deficit, and that’s why the blue lines are below zero, but is able to attract investment. And that’s all above the line and that’s why Kenya is growing. We earn the money, we don’t attract any kind of investments, apart from portfolio flows. How much investment do we have in the oil sector, roads, economy, agriculture, refineries. etc.? When you talk to people, they will tell you this sectors are not profitable. But why are people investing in Kenya agriculture? Why are they investing in roads in South Africa? Why are they building bridges? Why are they investing in power plants in Ethiopia? I am Chairman of a company called Black Rhino. By the way, I don’t have a kobo in that company, but I am a Chairman. This short man who owns black stone said to us: “Gentlemen, here is $5 billion to invest in power projects in Africa, a joint venture with Dangote on a condition that for every $1billion you put in, Dangote puts in $1 billion, so we have $10 billion to invest. Now, power companies are here trying to invest, negotiating. And what did we hear? One day some judge in a court sits down and says reverse the tariffs. I am here talking to someone in New York who cannot understand that a government can issue a power privatization plan; that investors can come in; that there is a regulator for power; that they looked at the numbers, looked at the cost of power, looked at what is cost recovery, agree on a tariff, announce that tariff, they bring in their money to invest on the basis of that and a court in the same country says this is illegal. You know, for you sitting here and for Nigerians, this may not sound well, in fact people were saying yes! They are cheating us. But, what that one judgement does in terms of the signals to foreign investors is very disastrous. There is no country in the world where a court had agreed to interfere with commercial transactions between the government and private investors that are in to attract investments. There is a contract! The judge did not even say do not give this going forward. He said the ones that have been done is illegal, and you expect somebody now to bring in $3 billion to invest in power in Nigeria? Knowing that you can tell him this is the tariff, and tomorrow your court can wake up and say the tariff is illegal? So, as planning ministers and commissioners, if you decide upfront that investment is important to you, the entire system has to be searched, to make sure that these signals are not set. If the government that has made the mistake is gone, you then offer your own set of incentives and make sure that they are transparent. If you offer somebody an incentive in cement, make sure that every cement manufacturer gets that incentive. Fine, its sectoral. Assuming cement is important to you, if you offer an incentive for agriculture, make sure that everybody who meets those conditions should get those incentives, not just somebody who knows his way around Abuja. The farms are not in Abuja anyway. The Lagos story is a story of what Nigeria can do with itself – transparency, consistency, regulations – and people can be rich… Lagos can do without the rest of this country. So, we must not let Lagos go. You can see this. Basically, no investment has come in, and as you can see, I am building a consistent story that you have had growth model driven by commodities and consumption, which is your problem, and you now need to shift and you have a growth model that is driven by investment. And for this forum, it means you got to stop thinking so much about how much the government can spend, as in how much can we get into this economy. Lagos has done very well. If I have money to invest, I will invest it in Lagos, because it is attracting investment. Lagos has realized a long time ago that the government cannot fund all it needs. And I just love what Lagos has done. The Lagos story is a story of what Nigeria can do with itself – transparency, consistency, regulations – and people can be rich. There is no problem if people can be rich while growing an economy. Nobody minds. But, in Nigeria people become rich when people are dying. Let’s take the Lagos story, and that’s why today Lagos state is 30% Nigerian non-oil GDP, and Lagos can do without oil. Lagos can do without the rest of this country. So, we must not let Lagos go. This country is better off with Lagos than with the Niger Delta. Let’s not make that mistake. We should be together as a country. Every part of the country is important. But, let us not be so obsessed by a resource, because we have had the commodity driven model, and we are blind to the potentials of an alternative model. Lagos doesn’t need oil. What is oil anyway? It is a raw material. You don’t drink it. You need it to move your vehicles. Now, you have electricity. You need it to fill your generator. Now you have solar power, and biomass. The future of oil is not there. So, those few people who are trying to break up this country over oil, after sometime that oil will be worthless. You are better off being in a country that is based on this model. This is a country of the future, that is the past. Let me start by congratulating the government for making changes. Unfortunately, those changes were a bit late. But, the adjustment has been very severe. My sense is that where we are today, the Naira is already undervalued. If you look at the real effective exchange rate, we are below the zero line. Basically, what this means is, if the Naira were to strengthen to about 9%, you will get exchange rate palliatives. So, you are not really under any more pressures for a devaluation. This is the nominal exchange rate adjusted for relative prices, and also adjusted for rates of our trading partners. So, on a trade basis, the Naira has gone from one of the most overvalued currencies when we were at N197 to the dollar, to the one that is undervalued. So, that adjustment has been made by the Central Bank. And what the Central Bank needs to do is just to allow this system to operate properly and stop panicking. You know, from what you can see here, even if the markets starts at N320, N340 or N350 to the dollar, if you allow it to operate, it will revalue itself and adjust. By the time you have taken over one bank, fire one bank MD, they will believe you when you make a threat. I made many threats as governor of the Central Bank that I never carried out. If banks messed up, I will say, I will remove you, and because I have removed bank MDs, they will say sorry sir. What is causing the problem is all the sense that we are not entirely flexible, and sometimes wrong signals. After you have allowed the flexible markets, you act as if you really don’t believe in it. These things don’t just work on fundamentals. I was in the Central Bank, the markets works on the basis of confidence and perception. There was a time speculators started hitting the market when I was with the Central Bank. The Kenyan Shilling got hit and got divided by 25%. Ghana got hit by 30%. South Africa got hit and they started heading towards Nigeria. And I called an emergency monetary policy committee meeting jerked up the monetary policy rate (MPR) by 200 basis points, jacked up CRR (cash reserve ratio) by 400 basis points and declared that I will defend the currency. I didn’t have the money to defend the currency, but everybody believed me and they left me alone. The market works based on confidence. By the time you have taken over one bank, fire one bank MD, they will believe you when you make a threat. I made many threats as governor of the Central Bank that I never carried out. If banks messed up, I will say, I will remove you, and because I have removed bank MDs, they will say sorry sir. They fell in line. So, if you are going on a flexible exchange rate, have the nerves. You have produced a fantastic document, stick to it. You can’t be any worse than you were. You are in a recession anyway, so you are trying something different. So, try it and try it properly. Real interest rates: Again, Central Bank has raised it and people have been attacking the Central Bank for raising the rates. Why? It’s not just about inflation. It is about stabilizing the currency, because the truth is that where we are today, the only way we are going to reverse this recession is to increase liquidity in the foreign exchange markets and reduce the gap between the official rate and the parallel market rate. And this is what I think the Central Bank needs to keep doing. A flexible exchange rate regime and a positive real interest rate will combine to bridge that gap. Bring in the dollars that we need to finance imports, and those imports of raw materials are the things that will increase production, and that production is what will lead to growth. On the treasury single account (TSA), they should just realize the difference between the dollars balance sheets and the Naira balance sheets, because I have seen this whole thing about banks being banned from foreign exchange markets for dollar TSA… NNPC is the only provider of dollar money, and they have lent out that money. If you apply the same rules on the Naira balance sheet and dollar balance sheets, without looking at concentration risk, you bring the banks down. I have been very critical of what the Central Bank has been doing since the beginning of this administration. I am very supportive of the decisions it has taken in the last few Monetary Policy Committee (MPC) meetings, all that we ask is that they have produced a fantastic document on foreign exchange rate they should do it. On the treasury single account (TSA), they should just realize the difference between the dollars balance sheets and the Naira balance sheets, because I have seen this whole thing about banks being banned from foreign exchange markets for dollar TSA. The Naira balance sheets of banks is highly diversified. The government deposits may be 20% of deposits. Banks are financial intermediaries. They engage in what is called maturity transformation. They borrow money short term and loan for long term on their Naira balance sheets. They have this money coming every day – current accounts, savings and deposits. If you tell them to pay off government deposits, they pay off and send marketers out and raise money. On the dollar balance sheets, Nigeria only raise dollar on oil sales. The IOCs (international oil companies) have their money in international banks. NNPC is the only provider of dollar money, and they have lent out that money. If you apply the same rules on the Naira balance sheet and dollar balance sheets, without looking at concentration risk, you bring the banks down. They have lent out these dollars. Look at the maturity of their assets. Give them time to pay back these dollars. For them to pay back these dollars, they have to find dollars elsewhere. Where are they going to find? Who is the other exporter, apart from oil. What do we export in Nigeria? And that is the point. So, they need to be very careful. So long as you know where the money is, give them the time to sort out their assets and pay back. Don’t precipitate a banking crisis and this idea of banning banks from foreign exchange market. In the history of this country, and Dr. Shamsudeen Usman knows that, very few banks have ever survived after being banned from foreign exchange markets, because banks has lent money to customers who depend on import to produce. If banks can’t buy dollars for those customers, they can’t produce. They can’t pay back their debts. You build up non-performing loans. So, let us think through the consequences of some of these decisions that we take. But, apart from that, I am extremely supportive. I think the Central Bank is doing the right thing, and I think we should encourage them. I think the government should be given credit to say we are going to retrace our steps. The government has said we are going to eliminate wasteful subsidies. I don’t want to go deep into this. I have been saying a lot about fuel subsidy since 2011-12. We have seen everything. Just an interesting thing. If you look at 2011-2012, in theory o, because I don’t believe it, we were importing about 60 million liters of premium motor spirit (PMS) every day. Now, we are down to a little above 30million liters every day, has our population gone down? Do we have fewer cars? Are we consuming less? All those numbers were fake. Very few banks have ever survived after being banned from foreign exchange markets, because banks has lent money to customers who depend on import to produce. If banks can’t buy dollars for those customers, they can’t produce. They can’t pay back their debts. You build up non-performing loans. Again, you can go back to the record 2011- 2012, I sat in front of the House of Representatives and made a presentation. I produced documents. I had documents that showed people claiming they had 15 vessels of 30,000 metric tons offloading in Lagos on the same day, and they were being paid subsidy based on those documents. People sat in their offices produced bills of lading, bribed everybody from Customs to PPPRA (Petroleum Products Pricing Regulatory Agency) to whatever and got money out. All they needed was a paper that says you have allocation, and based on that allocation they will go. We established LCs worth $8billion for importing petroleum products and spent another $8 billion in petroleum subsidy. Every dollar we earned from the oil sector went back to petroleum sector in 2011. Not one dollar went into education, roads, power. It went into importing fuel and paying subsidy on imported fuel. The numbers are there. I am glad again that we are moving towards removing these subsidies. They are painful. Let me make that clear. If you have to pay more for fuel, it hurts, it bites. The truth is that no system is perfect. And the subsidy system benefited a very small groups of criminals much more than it benefited the poor people. And if you are going to subsidies, please provide this subsidy in production. Provide cheap gas to power plants and set power prices to a level where they can make a profit without passing on high gas prices to customers. Reduce the cost of setting up a business. Reduce the tax burden on pioneer industries. Subsidize production. Do not subsidize consumption. Rather than give poor people subsidy on fuel that never gets to them, take that money and put it in their hands. We were spending $6 billion, $7billion per annum on fake subsidies. And where is that money today? It is all in private jets, private yacht, expensive jewelries, property abroad, that’s where it is. It is not in this economy. Its gone out. One number I will give you is that Nigeria earned $16 billion from the oil sector in 2011. I was the governor of Central Bank. We established LCs worth $8billion for importing petroleum products and spent another $8 billion in petroleum subsidy. Every dollar we earned from the oil sector went back to petroleum sector in 2011. Not one dollar went into education, roads, power. It went into importing fuel and paying subsidy on imported fuel. The numbers are there. And if you look at that town hall meeting that has been going on, on TV I gave this number then. Not that this one I am saying will change anything o! I am just saying it. But, tomorrow if you invite me, you will hear. Look at power generation. That is where we need to focus on. Let’s get the power reports back on track. Fantastic policy. Power was privatized. What happened? People bought DISCOs (distribution companies), because they had connections. Dr. Usman was head of what was called the technical committee on privatization and commercialization in the 1980s. I know because as a Merchant Banker, I privatized Okomu. Okomu oil mill is still there. As a solid company, because when they were in TCPC, they have a process where you don’t just buy a company. If you say you are going to invest, they had a process of making sure that after you bought that company, you make those investments. They don’t just sell assets to you. Privatization is not just about selling assets to people, it is about making sure that they make the investment they are committed to making when they bought it. So, we have people who bought DISCOs who said they will invest, but they have not invested. Land Registries. Lagos has done well, but you need to do more. In Lagos alone, you have 13 procedures to register land, according to World Land in Business Report. It takes 77 days, 10% of your property value and the quality of land is 7 out of 30, compared to 22 in the OECD countries. Lagos has now moved up, they are merging all relevant laws into a single piece of legislation. The only reason why I am not praising Lagos is, because I want to see the result first. But, they have at least realized that this is a problem. And I hope all states would look at this. Power and Land reforms are very important and having that data base is critical, especially for agriculture. Mark your land, give a C of O; let the farmer be able to use that land as collateral to borrow, or as security. Many of you had read Henandez De Sotos’ The Mystery of Capitals. Land is capital. I have that big problem here in Kano, especially in the Muslim villages. A woman’s husband dies and leaves her a farm. She doesn’t farm. So, her husband takes over the farm, he farms it, but that is her capital, and she gets no return on it. He uses her farm. He earns a living and he gives her chop money from her own money. I wrote an article in the Financial Times in London in which I criticized China’s relationship with Africa. It was very controversial … We are all importing from China. Those that export to China are exporting oil or solid minerals. China’s interest in Africa is not our development. America’s interest in Africa is not our development. Europe interest in Africa is not our developments. China’s interest is China’s developments. Likewise America and Europe. Please our government! Our interest should be Nigeria’s development. So, this issue of land is crucial to addressing poverty, especially poverty among rural women. Many of them own lands being hijacked by their husbands and they remain poor. And it is all cultural, but what I learn from “Tudun wada” is that the Christian woman has learned to farm and they come out to farm, because they love it. But, the Muslim woman has been stopped from farming, but in the name of culture. What the men had done is that they have taken over their capital, and it’s not religion. And therefore, as leaders, we have to address this social issues as part of economic rejuvenation. Trade Policy: You know, I keep sounding like a broken record 2012 – 2012. I wrote an article in the Financial Times in London in which I criticized China’s relationship with Africa. It was very controversial. I don’t know if you read it. But, if you google it, you will see it. Now, look at this. These are our trade with China. We are all importing from China. Those that export to China are exporting oil or solid minerals. China’s interest in Africa is not our development. America’s interest in Africa is not our development. Europe interest in Africa is not our developments. China’s interest is China’s developments. Likewise America and Europe. Please our government! Our interest should be Nigeria’s development. If the Chinese are going to come back and set up textile factories in Nigeria and buy cotton from our farmers and employ Nigerian workers and produce these textiles and sell to us, they are welcome. If they are going to produce textiles in Shanghai. Subsidize them. Bring them here. Bribe our Customs Officers. Come to our markets and destroy our industries, we have to say no sir! If China is lending us money, and we are going to pay back that money to import equipment from China, we should please check that those equipment are properly and transparently priced; that we cannot get them cheaper from another part of the world; and that they are of high quality. This idea that am lending you $1billion to buy rice mills from me, which you can get at half the price elsewhere, you have already paid interest of 100%. If you don’t know it, the price is not a cheap loan. Now, we go to these countries and we think there are no strings attached, especially at this time that the World Bank and the IMF and the Europeans are saying we want you to pursuit policies, China does not interfere. So, we are running to China, it is a good partner. We must trade with China, India, Europe with America. I have nothing against any of them. What I want us to do is to sit on the table with them and negotiate trade agreements that protect our interest, because that is what they are doing and that is what every reasonable country in the world does. So, I think we have talked about Fiscal Policy, Monetary policy, Trade and Industrial policy and if there is any message I have tried to send is that we have a model. Historically, that was driven by commodity growth, by consumer spending. We have a future that is based on investment that should come in. We need to move to an investment-driven model. We need to have some elements of state planning. We cannot just allow the market. The market will not put money in agriculture, refineries. So, you have to provide the incentive and lead capital so that’s where you are important and that what for me is the way forward. Anybody who tells you not to protect your industries is deceiving you. Create a level playing field between the infant industries and the big ones. So what’s the summary? The years of Africa rising where one child could lift us up are behind us. Sustainable inclusive growth now depends on investment. Please every planning commissioner should remember that its investment. The role government can play is now by getting appropriate market growth, and we said that you don’t have enough money. You have seen how much money you are raising per head. It is not much. Even if you move money from recurrent to capital expenditure, if the pull does not increase, it is not much. So, the government doesn’t have the pocket to do. If you got to look for private investments, local and foreign, to to do that, and you do that by having a corporate micro-policy and the government is getting it right, finally, and also creating a supportive business environment. So, set excess rate to intensify it flows, eliminate subsidies, that has been done. Now, address failures in the power sector value chain, starting with the DISCOs, digitize state, land registries, prioritise public spending towards investment and protect infant industries. Anybody who tells you not to protect your industries is deceiving you. Create a level playing field between the infant industries and the big ones. I am not saying go and protect everything, but they must be a way of ensuring through power, infrastructure, industrial plasters, research and technology, technical and vocational education and through appropriate trade and tariff policies that critical policies are incubated before they are allowed to go out on the streets.